A few years ago, I received an email from an acquaintance’s son. He had been “nominated” for an “Ambassador” program promising a cultural and educational experience traveling through Europe for 3 weeks. This young man was looking for donations from friends and family towards the cost of his trip- which was over $5000. Again, a few weeks ago, a student client asked me about a Leadership program for which he was “nominated” by a "teacher or counselor" (according to the letter) at his school. Again, the program promised a leadership experience at the low cost of $3200. Both of these young men are outstanding students, athletes, and leaders. Both young men are community oriented; both deserve recognition for their achievements. Neither should go on these trips. Why? Because they are sales pitches. Why are they sales pitches? BECAUSE REAL RECOGNITION AND AWARDS DON’T COME WITH A $3000+ PRICE TAG. A recent NY TIMES article on one such organization (NYLC) spells it out; although some of these programs afford their participants great travel and sightseeing opportunity, they are, by no means, selective or competitive, nor do admissions offices look at them as anything but vacation opportunities at the least, and a quasi-summer school opportunity at the best. Other programs offer recognition through paid-for membership and publications with no travel but with the appearance of selectivity: google NSHSS and see what pops. So how can parents and students who are inundated with fancy envelopes and congratulatory letters tell the difference between a resume worthy membership or experience, or a scam? 1. If the organization’s title is similar to a well-respected organization, such as National Honor Society, but does not have the same standards of admission or qualification, you may want to reconsider sending that check. 3. Check with the Better Business Bureau or Attorney General’s Office in the state in which the company is located to see if there are complaints or lawsuits against them. 4. If the program’s benefits seem as vague as their admissions standards, you may want to reconsider. 5. Is the company affiliated with a reputable charity, organization, or school? If it is an autonomous organization, you may want to check its bona fides before you consider. 6. Does the organization state that it is a not-for profit? If so, consider looking at its ratings on a charity ranking site, such as Charity navigator ( www.charitynavigator.org) or Independent Charities of America (www.independentcharities.org). 8. Does the organization use a "time share technique" to sell you their services? Come to the meeting at the local conference center and listen to our sale spiel. Act Now! Space is limited! You don't want your child left out, left behind, missing this opportunity! Sign up now and save 10%! Don’t be fooled by the fancy envelope. 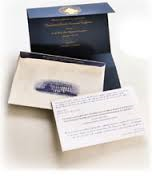 Some of these envelopes can cost you upwards of $8000; that's $8000 which could be used towards their college education- and that piece of parchment is actually worth something.